← The FBI’s Most Unwanted 5.5: Mulder’s Mucho Macho Movie! 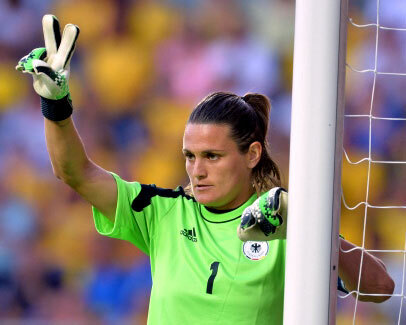 Football news: Yesterday saw Germany win the final of the UEFA Women’s Euro 2013 Championship, with substitute striker Anja Mittag scoring the only goal of the game (off a pass), and impregnable goal-keeper/team-captain Nadine Angerer fending off two separate Norwegian penalty shots! Apparently this is their sixth consecutive, and eighth overall, Euro win (despite failing to qualify for the 2012 Olympics), so snaps to them. In a wacky reversal of traditional gender roles, I know next-to-nothing about the sport, and can only make a facile comment about how cool the German uniforms looked, with their black base, red shoulders and gold lettering… much better than the boring old red-white-and-blue that Norway were wearing! The match itself (which took place in the Friends Arena, Sweden) was given a prime afternoon spot on BBC2, with an hour-long “highlights” programme following in the evening, on BBC3… during which the commentators were already hyping up the 2015 World Cup qualifiers, coming in September. One of the matches will be taking place in a town quite near me, and I’m almost tempted to attend… but it’s at moments like this when I’m faced with my own unmanliness, wondering how exactly a chap might go about acquiring tickets to a football match, and how one is expected to behave at such an event. Will I be required to sing something disparaging the referee’s parentage…? 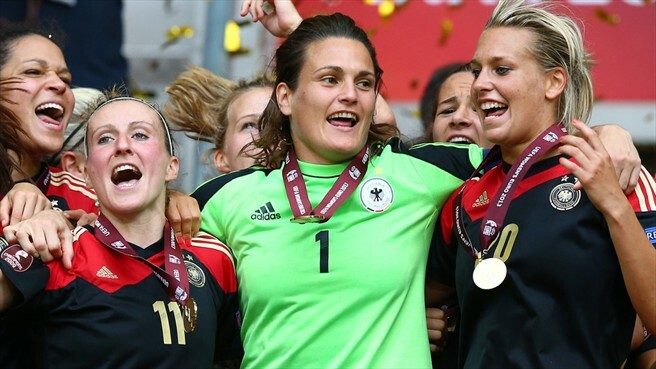 This entry was posted in Rants about TV and tagged Anja Mittag, Euro 2013, Germany, Nadine Angerer, Norway, women’s football. Bookmark the permalink.